For the prison, see HM Prison Pentonville. 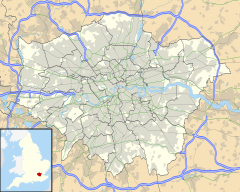 Pentonville is an area on the northern fringe of Central London, in the London Borough of Islington. It is located 1.75 miles (2.82 km) north-northeast of Charing Cross on the Inner Ring Road. Pentonville developed in the northwestern edge of the ancient parish of Clerkenwell on the New Road. It is named from Henry Penton, the developer of the area. A map showing Pentonville ward of Finsbury Metropolitan Borough as it appeared in 1952. Pentonville is the birthplace of John Stuart Mill (1806) and Forbes Benignus Winslow (1810), the noted psychiatrist. In 1902 Vladimir Lenin and his wife lived just off Pentonville Road, and it was at this time that he first met his fellow exile Leon Trotsky. Nearby places include Islington, St. Pancras and Finsbury. Pentonville is not the location of HM Prison Pentonville, which is located on Caledonian Road, some distance north in Barnsbury. The closest tube station is Angel. "Pentonville" is a track on the Babyshambles album Down in Albion. Mr Brownlow, the gentleman whose books were stolen in Oliver Twist, lived in "a quiet shady street near Pentonville" in the novel and most film versions. However, in the musical adaptation, Oliver!, he lives in Bloomsbury Square. ^ Pevsner, Nikolaus (1952). London except the Cities of London and Westminster. The Buildings of England. Harmondsworth: Penguin Books. pp. 232–233. This page was last edited on 3 December 2018, at 00:32 (UTC).